While Hans Selye’s definition of stress is commonly referenced when discussing hypothalamic-pituitary-adrenal (HPA) axis function, plenty of others exist. His definition goes something like “the nonspecific response of the body to any demand made upon it.”1 The response or general adaptation includes the physiological secretion of the pituitary hormones that activates the cortex of the adrenal glands. No matter what the type of stressor, the body responds similarly as the theory goes. Selye’s definition frustrated enough people that Singer and Davidson2 embarked on a project to further illustrate “nonspecific.” What they suggested is that stressors may have specific and predicable responses but the nonspecific responses are those that are shared among any physical or emotional stress. 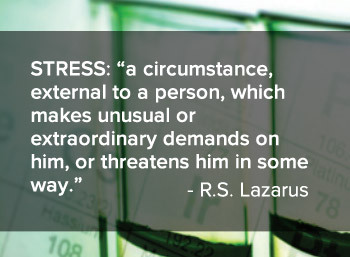 However, Lazarus defined stress as a “circumstance external to a person which makes unusual or extraordinary demands on him, or threatens him in some way.”3 Since people may react to the same situation differently, stress is thus “the responses or reactions of the person rather than the situation producing them.” Levine and Scotch pointed out that various situations are not objectively stressful, but are socially or psychologically defined as such by individuals in terms of social and cultural norms.4 If a person perceives a given situation to be disturbing or threatening and is unable to mobilize resources to handle it, his or her energy is concentrated on dealing with the disturbance. Thus, the result of such perception may be termed a stressful condition which is not necessarily a diagnostic category, nor is it abnormal function. While behavior and perception are key to the stress response, there are additionally corresponding changes in physiology, motor function, and cognitive function. Early stage responses to stressors include temporary changes in heart rate, blood pressure, galvanic skin response, perspiration, muscle tension, facial expressions, and further changes in perception and judgment. These distinctions are important for the practitioner. It is common for the practicing clinician to assign the magnitude of stress based on his or her own biases and perceptions rather than those of the patient. Divorce, death of a loved one, moving residence while generally suggested as stressful, may not impact each patient the same way. Conversely, even small life events should be examined within the context of perception by the patient when practitioner suspects the presenting condition has a related contribution from the stress response. The term “stress” is generally used to express both the stimuli and the responses associated with stressful conditions. Stress as a response involves the arsenal of physiological, behavioral, and cognitive responses aimed at restoring homeostasis. In spite of its generally accepted unpleasantness, it is important to remember that some degree of stress is essential for life. 1. Selye, H. The Stress of Life, McGraw-Hill, New York, 1956. 3. Lazarus, RS., Patterns of Adjustment and Human Effectiveness, McGraw-Hill, New York, 1969. 4. Levine, S and Scotch, NA, Social Stress, Aldine, Chicago, 1970.